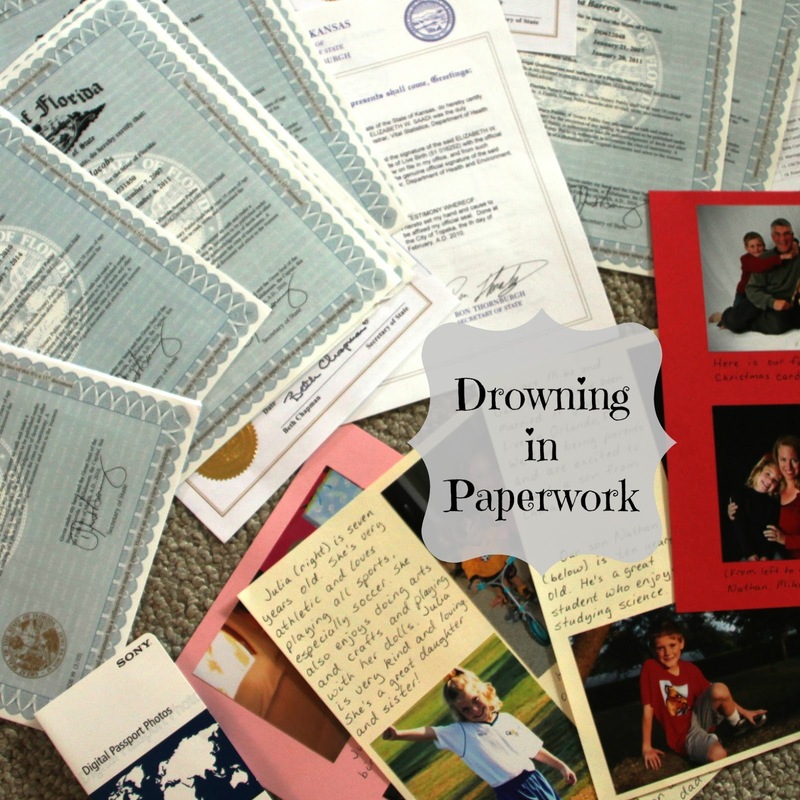 If you're in the process of adopting an older child, you are probably drowning in paperwork. I don't know why, but the paper chase phase made me really nervous. I was terrified I'd mess something up. And while it was a completely necessary part of the adoption process, all that paperwork did absolutely nothing to prepare me to actually parent my newly adopted older child. Sometimes I even think all the hoops adoptive parents have to jump through make us feel kind of entitled. You know, "Look how hard I worked and how much I sacrificed to bring you home." Just keeping it real here. So I can't help you with your paperwork. I'd probably have a mild panic attack just looking at it. 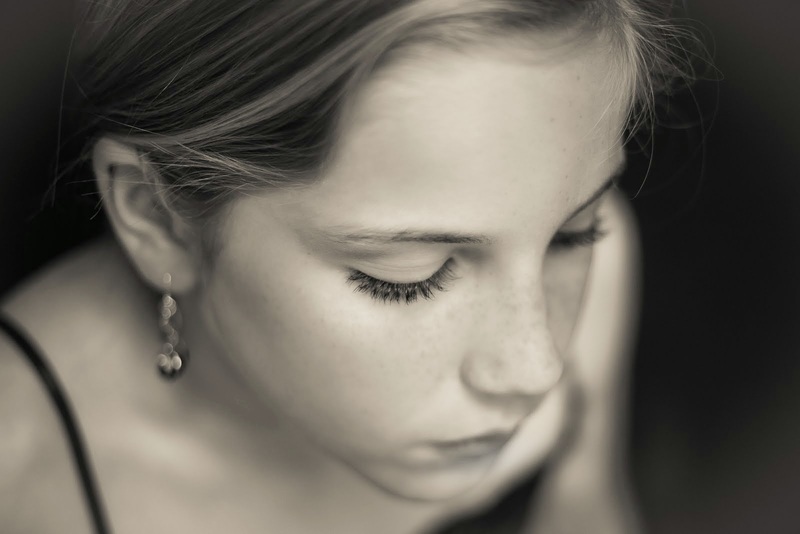 But I am excited to share what I've learned about parenting my older adopted child. When you're adopting an older child, you need to hear stories that paint a picture of older child adoption in real life -- because it may be different than what you expect. When you're adopting an older child, you need to add new tools to your parenting toolbox, because many times, your old tools simply don't work. When you're adopting an older child, you need relationships with other families like yours -- even if those relationships are online. For 31 days this month, you'll find all those things here at Death by Great Wall. My family was blessed by adopting an older child. To make the most of the next 31 days, I'd like to ask you to do three simple things today. 1. Whether you're a regular here or stopping by for the first time, please leave a comment and introduce yourself. I'd love to know who's reading, and truth be told, that first comment is always the hardest. We'll have better discussions over the month if you go ahead and introduce yourself today. 2. If you use Pinterest, make a new board. Call it Older Child Adoption or something like that. As you pin helpful resources over the next 31 days, you'll be creating your own adoption toolbox. 3. Share this series on Facebook or with your adoption support group. You can use the little buttons at the bottom of this post. Thanks for helping me spread the word to parents who might benefit from this series. See you first thing tomorrow morning! excited to follow along and thanks for doing it :). our family is a huge advocate for older child adoption. I'm so glad you're here. Thanks for being the first person to comment. It takes someone to get the ball rolling. Looking forward to reading this month. My kids are also doing some stuff on older kids. This week is up at http://www.thecorkums.com/2013/07/01/voices-siblings-and-parents/. Thanks Melissa. I've been following your posts. Good stuff. Hi Dana! Great idea. I'll try to share comments along the way. We're just entering the first lull in paperwork for our third older child adoption. Waiting for last piece of paper (from USCIS) so we can send it all to China. Sandy, if you have any ideas for this series or would like to write a post, please send me a private message, and let's talk about it. I was just thinking about you. I'm here Dana. Gonna stick by you for the month and soak it all in. We're likely gonna go for a child that's not quite an "older child" but not a toddler or baby. Somewhere in between. But learning is very very good. I've chosen to not exactly define "older child" for the sake of this blog beyond older than baby/toddler. Glad you're here! Thanks for doing this, Dana! My wife, Nanci and I will be following your blog closely. Our three adoptive children from Haiti are 14, 12 and 5. We are currently in fingerprinting, so the timing couldn't be better! Thanks for reading! I hope you'll add your input to the comments all month long. You are so wise to think with both your head and your heart. It really is a consideration that your biological kids are so young. We adopted a little out of birth order. Our youngest daughter was 6 when Wenxin came home at 7 1/2. It was the hardest on her because he took out all his grief and frustration on her. He was very mean to her. There is a reason why people recommend not adopting out of birth order. In the end, we were all able to work through things, and now they are close. But it was tough. Praying for wisdom for you. Im adding you to my blog list and will certainly be following. I am hopefully not much more than 2 months away from bringing home our twin girls(turning 3 next week) from Haiti, to join 4 brothers (ages 1,4,6,7) at home. Sounds like you are where I was three years ago. We traveled to China and brought Wenxin home September 2010. That summer was exciting (and honestly, kind of stressful) for me. Love your blog and look forward to the series. We have 1 bio daughter (7) and hope to bring our son (6)from China by thanksgiving (awaiting SCL). As you'll see, I have a soft spot for older boys from China. So happy for you. We are, Lord willing, bringing our 11 year old son home from Haiti this month (just waiting for the call). We brought our then six year old and two year old home (Haiti) 3-1/2 years ago. Hoping for some good insight. Mostly looking for schooling ideas (home schooling) to help the transition go smoothly. It was easy with a six year old as they were learning how to read, etc. at the time. Not sure what to do with one who already has been to 7th grade in Haiti (will be in 6th grade here), but needs so much catch up (American history, etc.). 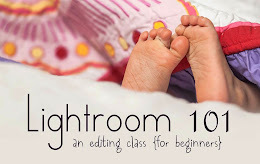 Check both the education and homeschooling tags over on my sidebar. Wenxin is younger, but he'd never had any education in China, at least none that we are aware of. I read aloud to our kids daily. I didn't dumb down the reading material, even though he was just learning English. It's amazing how much History and cultural info he's picked up just from books. Hello. My name is Amanda, and I'd love to start following your blog. We are in the process of adopting a 10 and 12 year old from Haiti. Our biological kids are 12, 9, 7 and 4. Amanda, I'm happy you're here. I'm looking forward to your series. we will be bringing our 3 yr old son home from Hait in about 6 months (hopefully) and I'm trying to prepare in every possible way! Kudos to you for preparing! You'll be so happy that you learned all you could ahead of time. I'm glad you're here and hope your little one comes home soon. Working on our dossier to adopt from Haiti while living in Haiti. Looking to adopt siblings. Keep us posted. That's exciting! You are exactly the parent this series is for! Hope you come back every day. Thanks for leaving a comment. We are parents of 6 children. One girl and 5 boys. Our oldest two are bio children 27 and 23 respectively. We have two teenagers whom we adopted from foster care at ages 10 and 11, now both 15. They are brothers. We recently adopted two brothers from Haiti who are 11 and 6, now home 4 months. Sounds like you could WRITE this series. Seriously. I hope you'll add comments and let everyone learn from your experience in older child adoption. Glad you're here! Not sure I could write it, but comment I can! We're still working several major issues through. My name is Alyson. We have two children born in Colombia that joined our family as infants, two born in KY that also joined our family as infants , and we are waiting for our son from Haiti to come home(he will be 3 in October). Looking forward to reading your blog! Glad you are here, Alyson. My name is Karmen and we're in the process of adopting biological sisters from Haiti, ages 7 and 2. We have 3 biological daughters, ages 11, 8, and 3. We're hoping to have our girls home before the end of the year and definitely need more parenting tools in our toolbox before they come home. I'm excited to read these posts and to connect with so many other families who have adopted/are adopting from Haiti as well! Thanks for stopping by. I look forward to getting to know more of the Haiti parents over this month. Thanks, Dana, for opening your heart and sharing your experiences with us "strangers". Thank you also for the encouragement to leave a comment - I almost never do! Our family is in the process of adopting 3 girls from Haiti, ages 5 1/2, 12, & 13. We have 5 bio children (14 - 31yrs) and am very interested in hearing about your journey so far. thanks for the opportunity to join in. The more the merrier! And thanks for commenting. It's actually easier for me to write when I have some idea of who's reading. I follow you already, and have added great ideas to our "parenting toolbox." We have one bio 9 yr. old and are leaving in a few weeks to adopt a 5 yr old from Ukraine. Love your posts and comments about parenting adopted children differently. Melanie - So excited for you. Sounds like it won't be long now until your new son is home! Seems like I might be the odd one out here, since adoption (older child or not) is still a 'maybe, possibly, someday' idea, but I've been reading up on it for the last few years, so that I can be as prepared as possible if and when we do go for it! Right now we have a 3 yr old and a 1 yr old. This is the time to be reading so that when the time comes you can make a decision with both your head and your heart. Glad you're here! Welcome Sharon. You are still in the very intense part. I hope you'll be encouraged here. I'm looking forward to reading the posts. We have had our daughter home for one year now - I know there is a huge need for people who are just entering into this journey to know they aren't alone in their feelings, or to be given more information as to how to manage. Denise - so glad you're hear. I hope you'll add your perspective and experience to the discussion. Hi, I'm looking forward to this series! We have bio children ages 12, 10, 7, and 4. We close to travel to adopt our almost 2 year old son from China. Older child adoption is on our hearts, and something we're still gaining knowledge about for the future. I'm excited to see from the comments so many considering or experienced in older child adoption! Congratulations on your new son. I have a soft spot for boys from China! I opened this blog when my dining room table was spread out with/to organize documentation/e-mails from 9 months of fighting Homeland Security...talk about timing. 36 months this month trying to bring home three siblings 17, 15 and 12. DNA testing required by US Embassy in Haiti for the oldest; hoping/praying this is one of the very last steps. Looking forward to all the insight this series can provide. Thank you! Hope you find some helpful tools here! We are in the paper chase for our 6th adoption. Our oldest at time of adoption was 2 1/2 but this one will be 8 when we get her and she has Down syndrome. Not nervous about the Ds and she'll be our 2nd with Ds but definately new to an older child. Hope you find lots of good info on older child adoption through this series. Congrats on your new daughter. I'm Molly and my husband and I are hoping to start an adoption process later this year. It's still up in the air as to where we may adopt from, the number of children, and the ages of those kids, so I'm trying to learn as much as I can from those who have experience. Thanks for this series! It's exciting to see people learning as much as they can before they make any decisions. That's so smart. Glad you're here! We will have our two adopted from Ethiopia home 2 years on July 14. They are a 5 year old girl and 7 year old boy. We also have two bio kids. An 8 year old boy and a 6 year old girl. Yes, that's right 5,6,7, and 8. I think there have also been some really unique challenges bringing two children into a family who are basically the same ages as the two children already there. I'm really looking forward to reading this and will be sharing it with some friends. Thanks! I know a lot of people have strong opinions about birth order and such. My kids today are 13, 10,10 and 9. We had a rough transition. Wenxin took out all his grief and anger on his younger sister. It was hard. Anonymous, I understand your concern. I'm 51 today, so some major changes started with me about the time we adopted Wenxin. I've often questioned the wisdom of mixing menopause and adding a child to our family, but we're making it OK. It keeps life interesting. Hi! So glad I found this! Thank you for doing this its such a blessing! We are in the middle of adopting our, 4year old soon to be 5year old daughter from China. Cassie, Congratulations on your new daughter. I'm glad you're here and hope it's helpful to you. 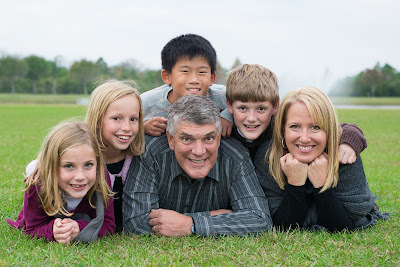 We have ten children, six bio, two stateside adoptions, and two just came home from China a couple of months ago. They are six and seven. All but three of our ten children are now adults, so we're parenting another round I guess you'd say! Randi, I've had fun following your blog and watching the girls adust to family life. Thanks for commenting. Jane, Thanks so much for stopping by. I'm honored that you would follow along! Wow! That's soon. Would love to hear about your trip and your new son. Can I just express how much I really, really, really like you? Like in an embarrassing Sally Fields/Oscar kind of way. You write from the heart with a Christian perspective that's not over the top. Your posts from 2009 all the way to today speak so much to us in our current situation....adopting a 9 year old who has otherwise been happy and stable in a foster home & school for the past 4 years. I especially get super excited when I read about a family who either chose to keep the child's Chinese name or allowed the older child to have a say in the process. Please keep writing, especially those posts which you feel like you're going to delete afterwards. Don't do it!!! (Delete them, I mean.) They're meant to be written and read. Jessica, Thanks for putting a big smile on my face. I was referred here by a friend. I am a young Christian man about to get married. We eventually want to adopt. Thank you for the resources. Thank you so much for reading! I think it's amazing that you are thinking ahead and preparing. Congratulations on your upcoming marriage. This is exactly what we've been looking for! 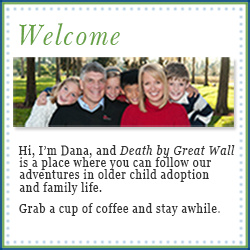 We travel this fall to Shanghai to bring home our daughter who is seven. We are sponges, ready to soak up any info we can. I guess I'm a little late to jump in here, but this will help me get a picture of what things are really like when our4 year old son from China comes home in 2-3 months. I just stumbled here after googling something about the first days home after adoption. Thanks for sharing your experience. I look forward to reading this series. Hi Dana. I am glad I found you and your blog. We are just selecting our agency for the home study, and are looking to adopt an older child. I appreciate your perspective.